FRED DE SAM LAZARO, correspondent: Minnesota is where the idea of making things easier in the kitchen became an industry; home of such legends as the Pillsbury doughboy, the Jolly Green Giant, and Betty Crocker. Old Betty Crocker TV spot: "I guarantee a perfect cake every time you bake. Cake after cake after cake..."
DE SAM LAZARO: Perfect? Maybe not. But convenient and efficient? No question. And that’s the idea behind this nonprofit company in St. Paul called CTI, or Compatible Technology International. Different cakes, though. 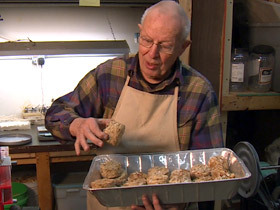 Erv Lentz is squeezing discarded peanut shells, trying to make fuel briquets. He’s 83, one of dozens of retired engineers, agronomists, and others who volunteer here. Vern Cardwell is another. He’s 78. DE SAM LAZARO: They’re working on conveniences for a very different kitchen and customer: tens of millions of subsistence farmers in poor countries. CARDWELL: Here are what it looks like when it comes out. We’re obviously stripping all of the florets off that contain the grain. DE SAM LAZARO: This hand-cranked thresher could save hours of labor and extract grain far more efficiently than the manual methods used now. This test is on stalks of pearl millet—a staple in parts of Africa. LENTZ: Just blows your mind when you think how overnight, we can, for instance, help their useful pearl millet from 30-35 percent to darn near 90. DE SAM LAZARO: At least in theory. Over the years they’ve learned some hard lessons about the reality in a Minnesota lab and that in a village in, say, Malawi. Steve Clarke says they went to try out one invention in that southern African nation. STEVE CLARKE: We had this great tool here called the grinder, which we knew could grind peanuts into peanut butter very well. But when we got over to those countries, we found out they didn't make a lot of peanut butter. FRED DE SAM LAZARO: What they needed was a peanut sheller. Diet, social traditions, gender roles all play a role in how a product is received. ALEXANDRA SPIELDOCH (Executive Director, CTI): Tools that are designed in a void are largely not going to be adopted. They're not going to be accepted, and therefore the whole process of design needs to be about really understanding the context. DE SAM LAZARO: One device they’ve had some success with is a water chlorinator. Unlike those used in rich countries, this one uses no electricity or pumps. Wesley Meier is one of few paid staffers at CTI. He heads this program in Nicaragua. WESLEY MEIER: Simple device, designed by an engineer based out of St. Paul. So this is just the container for the tablet. This is the actual chlorine tablet. There’s five of them in here. DE SAM LAZARO: Dozens have been installed in remote mountainous communities in this Central American nation. The water supply in this area is mostly driven by gravity. It comes from natural streams up the mountain and flows by gravity into tanks like this one. The tiny community of Las Animas is having a CTI chlorinator installed. When it's done, the 380 residents of the village will have safe water at almost no additional. The device costs just $150. Its plastic pipes and chlorine tablets are available locally. Community leaders are given simple metering devices to monitor chlorine levels and instructions on changing the chlorine tablets. 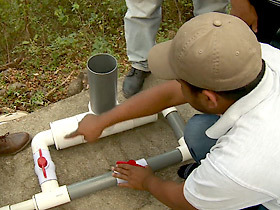 EMILI JUAREZ: (through translator) We knew it wasn’t potable water, and we really needed to install this system. We know that unclean water can lead to diseases like diarrhea and hepatitis. DE SAM LAZARO: Does that end the conversation there? DE SAM LAZARO: CTI’s annual budget is $750,000, mostly from charitable donations. But that doesn’t include thousands of hours volunteers like Erv Lentz put in pursuing the perfect pedal-powered potato slicer, grinder, or pepper shredder. 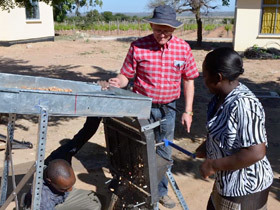 Vern Cardwell did manage to come up with a peanut sheller and got to see it demonstrated in Malawi. CARDWELL: By hand they can get two pounds of nuts shelled an hour, and with our disc peanut sheller we can do 50 to 60 pounds of nuts an hour, and the women look at that, and they're just giggling, and they're all excited about this piece of equipment, and everybody wants—“You'll leave it here? You'll leave it here so we can use it?” And that kind of excitement is very infectious. DE SAM LAZARO: There’s the intellectual stimulation of working with other experts, these volunteers say, and a strong moral driver of the work. CLARKE: For some time now I've realized that my neighbors are not just the folks living down the street or over a block, but they are living all around the world. They're living in Rwanda, they're living in Kenya, they're living in Senegal, they're living in Morocco, and so forth. And we need to be looking out for each other. 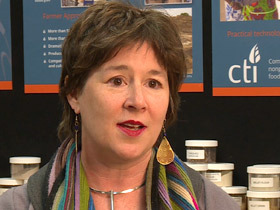 CARDWELL: And to the degree to which we can create self-sufficiency and well-being for all peoples, it makes this planet a better place for everyone. 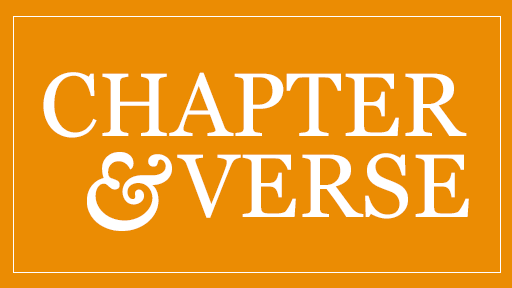 LENTZ: I worked almost every day "fixing things," if you would, at House of Hope Church, and it finally dawned on me that the impact of what I was doing maybe hit 100 or 200 or 250 people at the church, whereas the impact here is endless in terms of the impact on people. So I rather switched it to working here. DE SAM LAZARO: He’s done that almost full-time for 20 years. For Religion & Ethics NewsWeekly, this is Fred de Sam Lazaro in St. Paul, Minnesota. 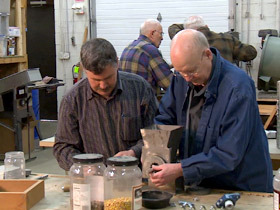 In Minneapolis, dozens of retired engineers and other volunteers at Compatible Technology International are making water purifiers, threshers, grain tools, and other inventions designed to improve the lives of farmers in small villages around the world. They see it as being good neighbors in a global community.